Thank you for choosing Offshore Sailing School for your sailing or power education. We truly appreciate your business and hope you will come back to join us again soon. In the meantime, here are some great benefits just for you! Keep us in mind when you have a sailing experience you’d like to share. Send us your stories, photos and videos. If you haven’t already, please share your experience on our social media outlets: Facebook, Twitter, Trip Advisor, Yelp, YouTube, Pinterest, Instagram. Thanks so much for choosing Offshore! 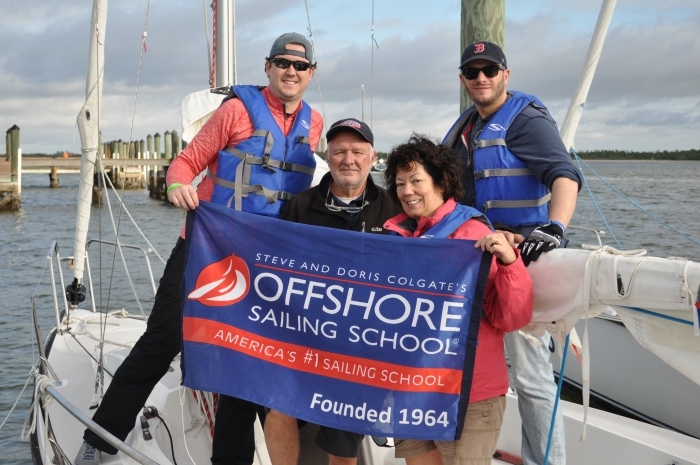 As an Offshore Sailing School graduate, you are entitled to a $100 lifetime discount on certification courses that are not already at special rates. If you sign up for one of these courses within 60 days of finishing your last sailing school or power school course you can triple your discount and take $300 off your next certification course learning adventure package that includes a resort stay. The course and date you choose can be anytime in the future. Call your sailing advisor at 888-454-7015 today to take the next step. The header on this page was taken this summer during our Tahiti Flotilla Cruise, and the gals shown here are participants on that cruise. 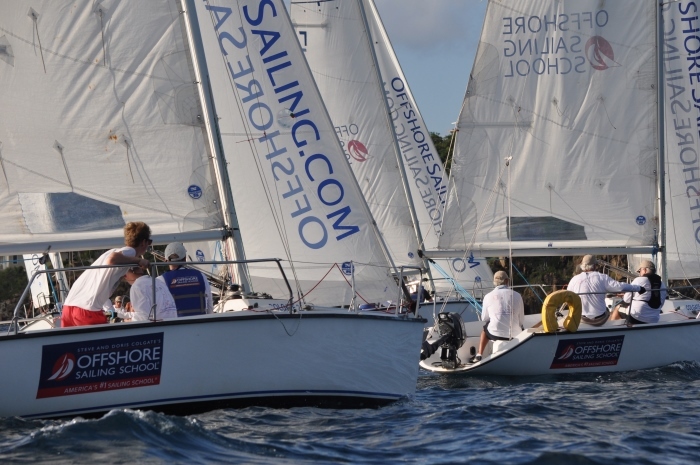 All our Colgate Sailing Adventures – Offshore Sailing Club Cruises fill quickly when they are announced. Led by cruise leaders, Nate and Heather Atwater, you get to see the world under sail with like-minded sailors. We do all the work – charter the boats, sign the contracts, put the itinerary and crews together, arrange for provisioning and fun times ashore, and more. Just pack your sailing clothes and head to our next destination. Check out our upcoming flotilla cruises and call 888-454-7015 to sign up now! Offshore Sailing School’s long standing partnership with The Moorings goes back to 1973. They have the best boats and the widest variety of fantastic places to charter. 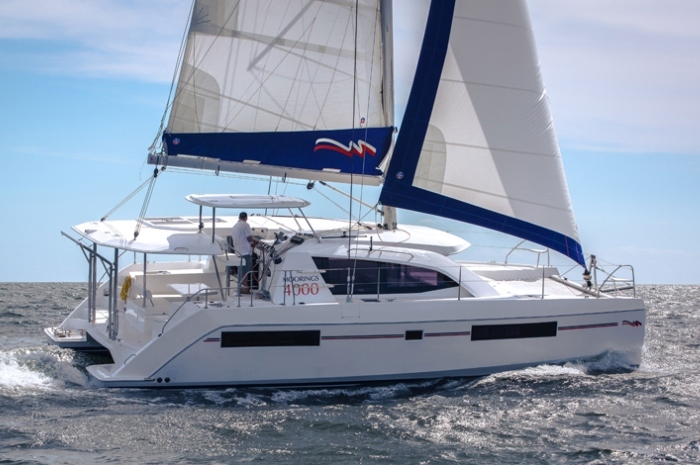 If you achieved Bareboat Cruising or higher Certification from Offshore Sailing School, you can save up to 15% on your first charter with The Moorings. You also receive more benefits as a member of The Moorings Captain’s Rewards Program. 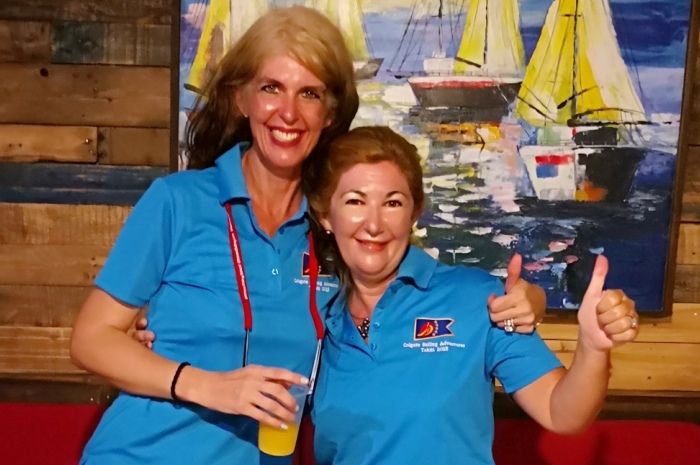 If you gained Bareboat Charter Certification from Offshore Sailing School, contact The Moorings, (877-299-5586), to jump start your cruising lifestyle! Your US Sailing Basic Keelboat Certification comes with a free one-year membership in this very worthwhile organization. Take a look at everything US Sailing is doing to promote the sport of sailing. This is the governing body of sailing in the United States, organized in 1897 and appointed as the sailing national governing body by Congress in 1978. 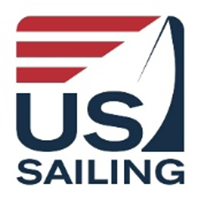 In this role, US Sailing represents the U.S. in all international competitions including the Olympics. But more than that, it provides many avenues to participate in sailing and racing on a local level and continue your sailing education. When you earn US Sailing Bareboat Cruising Certification, you can get your International Proficiency Certificate (IPC), which enables you to skipper boats in Europe, the Med and other dream destinations overseas. Go to https://www.ussailing.org and search IPC for more information. When your membership year is up, don’t forget to renew your membership! 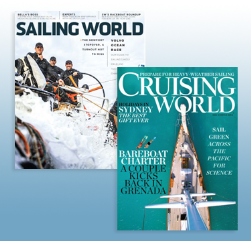 As an Offshore Sailing School graduate you are entitled to a free one-year subscription to Cruising World or Sailing World magazine if you have a valid U.S. mailing addresses. For great information about cruising and stories from sailors who are experiencing the joys seeing the world under sail, choose Cruising World. If your interested in performance techniques and competitive sailing, you can’t beat Sailing World. Click here to get your free subscription now. 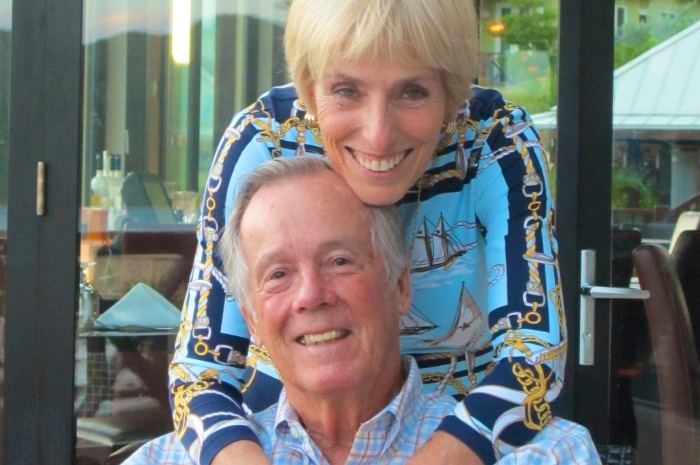 Did you know that our President and CEO, Doris Colgate, served on the BoatU.S. National Advisory Council for over 17 years? Are you aware the BoatU.S. Foundation produced our comprehensive Learn to Sail Online Course? It’s a great organization that works hard for sailors and boaters rights. Now you are eligible to join the BoatU.S. family of over 600,000 members with an exclusive low membership discount. You get a great monthly magazine, super deals at West Marine stores, exciting sailing vacation offers, and for those of you who own boats there’s more: low cost marine insurance with low or no deductibles, on-the-water and on-the-road towing service, discounts on fuel, repairs and transient slips at over 900 marinas. Go to www.boatus.com and use the Offshore Sailing School promo code: GA84797B and become a member today! If you book a team building, leadership or incentive adventure for your group and/or employees, you get to sail with them free. Any Offshore Sailing School graduate who brings a group of 8 or more (2 boat crews) to participate in our popular and very rewarding Corporate Sail-Race Challenge® team building programs, or another of our great group adventures, gets to sail with the group free! Our Corporate Sail-Race Challenges® improve leadership skills and synergy among corporate teams. For more information on these programs call 888-454-7015. Every day we get evaluations with accolades about our instructors and an awesome” learning experience. You have probably already shared photos and stories about your Offshore adventure with friends and relatives, co-workers and new acquaintances. We get lots of referrals from our grads but seldom know which grad told a new lead about us. Send us names and contact information for everyone you talk to about Offshore who shows interest in learning to sail or sail better; and for each person that signs up for a course, we’ll send you a $200 gift certificate to use towards a future course or cruise. You can also request free gift certificates ($100 per person) to give to those you think would like to take a course with Offshore. For more information contact Beth Oliver, Boliver@offshoresailing.com. Sailing – Good for YOU. Good for the World!